University can be hard to navigate for anyone, but especially those who have some kind of disability or illness that makes day to day activities harder. I started my university education in a joint program with two institutions. This program allowed for a mix of art from one university and architecture from the other. This is a 5-year program that allows me to receive 3 degrees in the end. This past spring, I received a Bachelor of Arts with Distinction from the first University. This fall I am entering into my 4th year of architecture school and plan on graduating with my Bachelors this upcoming Spring, From there I want to finish my Masters of Architecture. 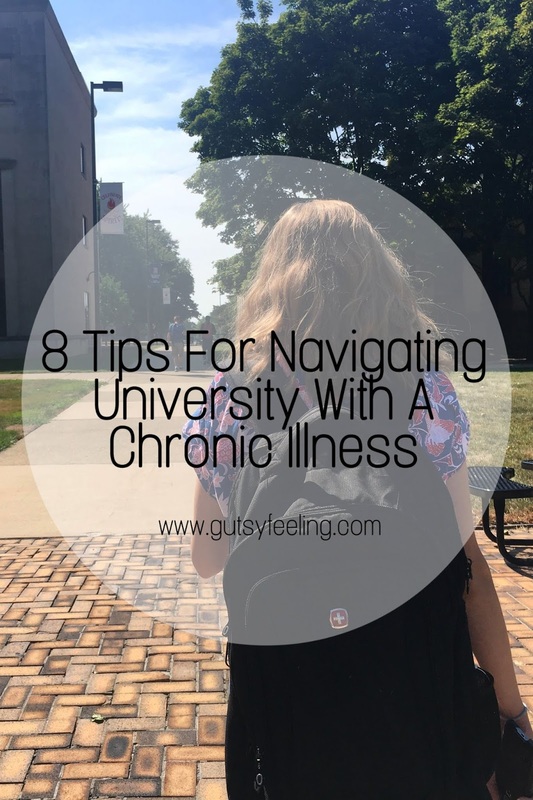 I have decided that I want to share my tips and tricks on how to navigate university when living with a chronic illness because despite the odds being against me, I have succeeded. I was in tremendous pain last school year because of the narrowing in my intestines and constant stomach distention. However, I still managed to succeed and not let my disease take away my passion. I owe my success to my hard work and the following tips and tricks. Disability services provides a wide variety of services to accommodate a variety of people with many different conditions. Some of which include learning disabilities, such as ADHD, Anxiety, and Depression, and physical disabilities, such as Chronic Illnesses, Mobility impairments, and more. When I began school, I was having very few symptoms, however I still decided to sign up for disability services in case something was to happen. When I signed up for the the disability services in first year I met with my coordinator to go over my condition and any accommodations I would need. In order to do so, I needed to get a letter from my doctor to confirm my condition, so make sure that you do this before you start university. We decided that my accommodations were to include: extensions where necessary, writing my exams in the disability services office if needed and to have excused abscesses from classes for appointments where necessary. Once, I was signed up I had to give each one of my professors a letter to say I was registered with Accessibility services. It was a very discreet letter and it was very nonspecific which was nice to retain my privacy. From there on out I met with my coordinator at the beginning of every semester to go over my condition and get new letters for my professors. As I become sicker in my third year I wrote my exams in disability services and was also able to move some of my exams to balance out my exam season. This was nice because I was able to write in a quieter environment and they could stop the clock every time I used the washroom. Talking to Professors can be very intimidating especially if you have a large or small class size. If it is a large class you may be worried of getting up in front of a lot of people to go talk to your Professor, but if it is a very small class, you may worried that people could over hear. Either way it can be hard because you want to try to live as much of a “normal” life as possible and not draw too much attention to you. My approach when talking to Professors is as followed. At the beginning of each semester I find it easiest to email my professors to schedule a time to meet or have the conversation through email if that works better. I think emailing is especially helpful for my elective classes where they have hundreds of students. I try to introduce myself in my email by explaining who I am, what program I am in, my disability (as much or as little info as I want), and what they can do to accommodate me if needed. Because of the nature of my program I have a studio class, and, in this class, there is only 12 students. I will see this teacher 3 times a week for up to 18 hours, so it makes more sense for me to explain more of my needs and disabilities with a teacher that I will be seeing more often, over a class that is a 3-hour lecture. However, depending on your situation you may feel the need to disclose or withhold more information based on the course, or how you are feeling. One thing that I urge people to do is to always send an initial email at the beginning of the semester. Your professor will not be happy and will be a lot more reluctant to help you if you need an extension in the last week of the semester if you don’t discuss your accommodations early on in the semester. Overall, your teachers are only here to help you and they will do all they can to make your learning experience as enjoyable as possible. 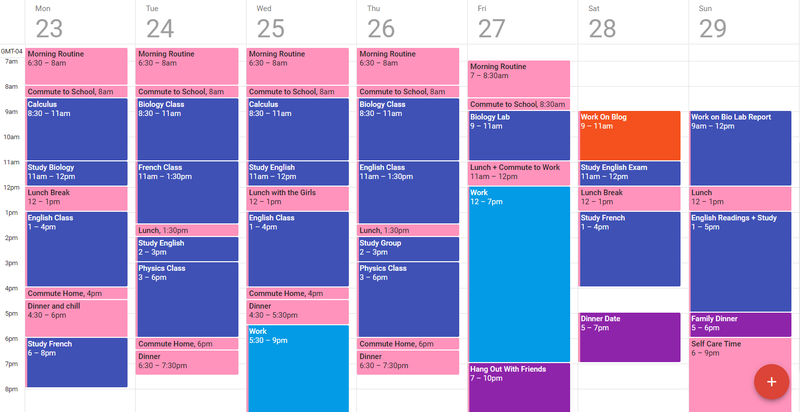 University can be very busy and a lot to handle. That is why it is critical to plan ahead and stay organized. You may like to organize your life in a digital calendar like Google Calendar, or you may like to use a written diary. Whichever it is, you should try to Calendar block your time. What this means is that you will be blocking out a specific amount of time for each task in your day. Try to do this, rather than creating a To-Do List and you will be amazed how much more you will get done. Here is just a fake sample week that I created to demonstrate how easy it is to block out your time to be more productive. Another tip on staying organized is to print out a printable calendar for each month in your semester (September – December), and use it for important dates for your classes only. This helps to keep school all on one calendar. I personally use a different color pen for each of my classes and write this all out when I get my syllabuses in the beginning of the semester. This helps me to see all my deadlines at a glance and helps me to know when I will be very busy so that I can plan accordingly. If you are moving away for school you may need to think about moving your prescriptions to a new pharmacy on/near campus. This is also applicable for anyone that is also on a biologic. Contact your biologic coordinator in advance to help move your infusions closer to your new town/city for school. These are often things that can be over looked, but are very important to coordinate well in advance. It is easy to slip into school mode and the hustle that comes with it. However, it is important to remember that although school may seem like a very important and huge part of your life right now, it is not everything. It is important to know when you are overly stressed or when you need to take break from school in order to keep your health in check. Because in the end your health should be your #1 priority. If this means that you have to take a semester off, so be it. If this means that school will take you an extra year because you can only handle part time, that is okay. Although I never had to differ a year of school, the thought definitely crossed my mind. Just remember that it is okay to take things slower than others, and although it may seem like the most annoying and hardest decision, one year of extra school is no time at all in hind sight. Prior to having surgery I experienced very bad bloating, stomach distention, and muscle pain from the narrowing that I had in my intestines. This caused me a great deal of pain that became very hard to manage. However, I did bring certain things to school with me in order to help ease the pain. One thing I always had on hand was, peppermint oil, this was amazing at numbing the pain. The second was gas-x, which helped to alleviated some of the discomfort on some days. Thirdly, I carried a heating pack in my car with me so that I could plug it in on my commute to and from school. I wrote a whole post on my pain essentials, if you want to know more. However, my point with this tip is to always carry some little comforts that can make you feel better and help ease any pain you could experience. As I said before, your health should be your #1 priority, always. So, taking some self care time is very important especially during stressful times. I just wrote a blog post all about my top tips on how to incorporate more self care into your life in my previous post, which you can see here. I also wrote a whole series on increasing self love, confidence, happiness, and self care, called #GutsyFeels. During University it can be very tempting to buy cafeteria meals and never bother to eat good, nutritious food. However, this can be very bad for people with chronic illnesses. The processed, fatty foods that are often found in the residence food halls can be very bad when eaten everyday. So, try to make your own food as much as you can. I would recommend to meal prep a bunch at the beginning of the week so that you can pack your lunches very easily to bring to school. If you are living in residence you can still do this, but you will have to get a bit more creative with the microwave. Furthermore, there are typically community kitchens in residence you can use, so take advantage of those features. If all else fails, try to pick the healthiest options from the cafeteria. Overall, I hope that for those of you going back to school you found these tips helpful. If you did like this post, let me know by commenting down below, tagging me in a post on Instagram sharing your thoughts, or directly messaging me on Instagram. Make sure you subscribe to my email list for my blog to get updated on my new posts every Sunday. Also, follow me on Instagram for more day to day updates on my life. I am a 21-year-old Canadian woman with a passion to share my Crohn's journey with the world. My mission with this blog is to help Chronic Illness Warriors go after a better life with the use of self love, motivation, and health tips. I am currently in my 4th year of university for architecture school, and will be doing my Master's next year. If you want to know more about my health journey and myself, make sure to check out the "About Me" tab at the top of the page.